Since February is the 100th anniversary of Ronald Reagan’s birth and I still haven’t gotten over my man-crush on the Gipper, I figured it would be interesting to look at Reagan’s fiscal record, particularly to see whether he was successful in restraining the growth of domestic spending. There is lots of good information in the Historical Tables of the Budget, which is produced by the Office of Management and Budget. I was particularly fascinated by the data on inflation-adjusted total domestic spending (discretionary and entitlements), which can be obtained by adding columns E and H of Table 8.2. 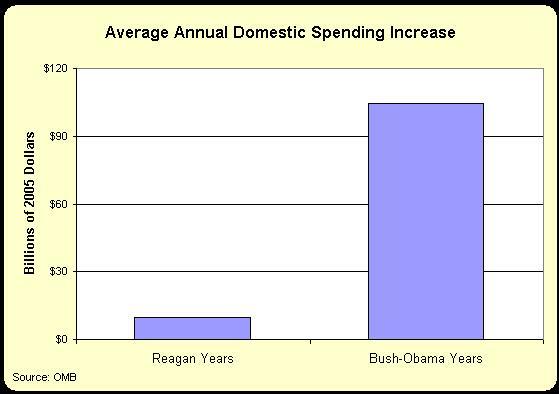 As you can see in this chart, Reagan managed to limit average domestic spending increases to less than one percent per year. These figures, which are adjusted for inflation, show that spending has grown more than five times as rapidly during the Bush-Obama years. The comparison is even more dramatic if we examine the average annual increase in inflation-adjusted domestic spending. In other words, we’re looking at how much spending increased each year, not the percentage change. During the Reagan years, overall domestic spending grew less than $10 billion per year, while spending has soared more than $100 billion per year during the Bush-Obama era. Remember that we’re using inflation-adjusted dollars, so this is an apples-to-apples comparison. The final chart maps annual domestic spending (in constant 2005 dollars) for Reagan’s eight fiscal years on the right vertical axis and the 10 fiscal years of Bush-Obama on the left vertical axis. Two things stand out. First, the bailout dramatically affected outlays in recent years, both because of a huge jump in fiscal year 2009 and an artificial dampening in the past two years (because repayments from banks and other bailed-out institutions count as “negative spending” rather than revenues). Second, you can’t blame the poor record of Bush and Obama on bailouts. 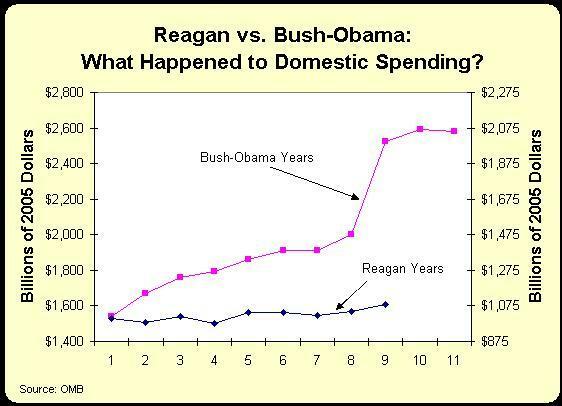 The chart axes are designed to give a similar starting point for Reagan’s spending and Bush-Obama spending, and it is obvious that Bush’s approach of so-called compassionate conservatism meant a bigger and more wasteful budget for domestic spending. Obama promised hope and change, of course, but he grabbed the big-spending baton from Bush and continued in the same direction, though TARP payments and repayments make it more challenging to discern the precise impact of the “stimulus” and other Obama initiatives (Tables 8.6 and 8.8 of the Historical Tables have program-by-program data for those who want the gory details). Last but not least, don’t forget that FY2009 began October 1, 2008, nearly four months before Obama took office, and the bad numbers for that fiscal year generally should be attributed to Bush. Yes, Obama added to FY2009 spending with an omnibus appropriations bill and the faux stimulus, but I’ve estimated that 96 percent of that year’s spending was the result of Bush Administration decisions.